SIDNEY, Iowa — Lacey Kiefer has spent the past year learning from her father, David Lueth, how to farm soybeans and corn on 500 acres of valuable river-basin farmland here. Her husband left the Air Force last year after a decade in the military, and they saw farming as a potential future. Now, those once-fertile acres sit under the water of the Missouri River, which swelled as part of the massive flooding that inundated the Midwest last weekend. Sitting in the Silver Spur Bar and Grille at lunchtime on Wednesday, Lueth's lips quivered and his fist trembled after a neighbor showed him an aerial photo of floodwaters receding from his house and farmland. Lueth's family is now staying with friends as they wait for the floodwaters to recede — and reveal whether their hopes for the future remain. 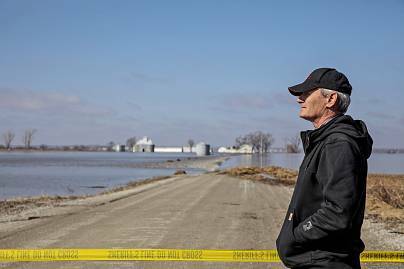 "We've done this before," said Lueth, 61, who is in his 35th year farming and has seen flooding multiple times in the past. "But I just don't know if I want to go through it again." 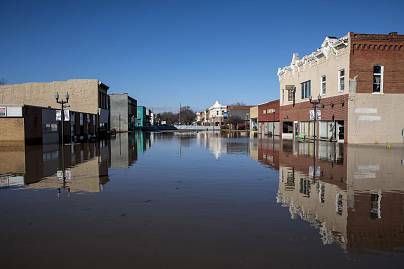 Floodwaters have devastated farmers and rural towns here in the Midwest, forcing people in southwest Iowa to contend with difficult questions about their loyalty to a home they love and the unforgiving floodwaters that seem to strip them of their way of life with growing frequency. The flash flooding from a combination of warming temperatures, sudden snowmelt and heavy rainfall has been felt from Nebraska through Iowa and down into Missouri. The waters have killed two, burst through a dozen levees on the Missouri River and caused nearly $1.4 billion of losses in Nebraska alone, according to the Associated Press. And with climate change an ongoing threat, extreme weather events like this will likely be increasingly common in the future. 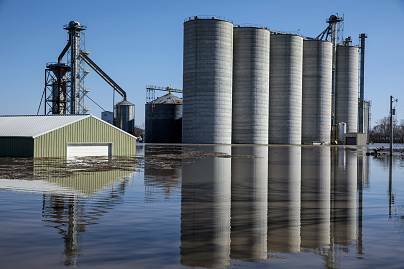 Some farmers and local residents fear the unknowns caused by the floodwaters, with many questioning whether they can continue to live and work while battling unpredictable weather and a Missouri River that floods with increasing regularity. But some also say that it has emboldened them to become louder advocates to get the help they need from politicians to protect their homes — communities that are often forgotten in the national conversation. "We have to make this in our wheelhouse," said Jeff Jorgenson, a local farmer and district director for the Iowa Soybean Association, "because we're working to try to save our community." At the Silver Spur this week, farmers compared notes and photos to understand the ripple effects of the flood on themselves and their neighbors. Many likened it to the devastating flood in 2011, but with the caveat that the impact of these waters would be much worse and longer lasting. "Lot of folks won't be able to continue after this," said Julius Schaaf, 66, who said 1,500 of his 4,000 acres was currently underwater. Because of rain, changing temperatures and the speed at which the water arrived, many of the gravel roads farmers use here became impassable in the days leading up to the sudden deluge. Most who operate here were unable to save the soybean and corn bushels they'd kept in grain silos. With commodity prices currently at a record low due to a crop surplus and the Trump administration's trade wars, some farmers had hoped that storing the crops until prices rose would earn them a few more cents per bushel. In Fremont County alone, local farmers pulled together a quick estimate that the flood affected 28 local producers' farmland. Of those who stored grain, only three were able to move theirs before the water came and ruined nearly 1.8 million bushels of corn and soybeans. Much of the grain lost by these Iowa farmers is uninsured, and they estimate that they lost a total of 390,000 bushels of soy and 1.4 million bushels of corn — totaling about $7.3 million in damage to their farm operations. For context, American farmers yielded 14.42 billion bushels of corn and soybeans between September 2017 and August 2018, according to the USDA. 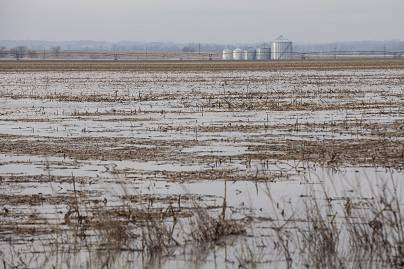 For some, the flooding could mean losing both their 2018 crops and their 2019 crops, because the lingering water stripped topsoil and left behind sand that could delay planting. Most farmers had planned to plant seed in fewer than four weeks. Few can afford those kinds of losses in good years, but the waters have made an already grim situation increasingly dire. The flooding will affect farmers here for years. "The reality is this isn't going to be over for a very long time," Jorgenson said. "It took years after 2011 for people to come back. For me as a farmer, there are flooded acres here that to think that I'll be able to plant a crop in 45 days is just virtually impossible." That water like this would arrive so suddenly came as no surprise to some farmers here. They've dealt with a growing number of floods on their land since 2004, when the Army Corps of Engineers amended their flood control practices on the Missouri River. That led to a lawsuit in 2014 of 44 plaintiffs representing farms that extend across six states, from Bismarck, North Dakota, to Leavenworth, Kansas. They contend that the Army Corps of Engineers has prioritized fisheries and recreation over flood control. The landowners allege that the Corps' changes to flood control has led the federal agency to intentionally use their farmland to dump excess water from the Missouri River's levees and dams — which they say has happened more than 100 times in the past 15 years. The lack of compensation for that use of their land violates their Fifth Amendment rights, they say. Leo Ettleman, 64, one of the plaintiffs here in southwest Iowa, said that the water covering more than 90 percent of his 2,200 acres and his lost grain once again proves farmers' concerns. His eyes grew red talking about these latest losses and whether his 42-year-old son, the seventh generation to farm in this county, could afford to take over the family farm. "I don't think he wants to give up, but it's going to be tough," Ettleman said, wiping his eyes. "Young family and all that — we just don't know." The Corps maintained that while there was risk of increased flooding bychanging its priorities around the Missouri River, it did not directly intend to cause flooding on their land and should not be held liable. Judge Nancy Firestone, who sits on the United States Court of Federal Claims, ruled in favor of the farmers, and damages have yet to be set. She denied the government's motion to reconsider last week. Seth Wright, a lawyer for the farmers, said that his firm is beginning an investigation of the current flooding to determine whether they will sue on behalf of those farmers affected by these floodwaters who aren't part of the pending lawsuit. "We're ahead of the game and aren't starting from scratch, but we still need to do our due diligence to make sure liability is there," he told NBC News. But Ettleman, Lueth and a handful of other local farmers, who gathered along a dirt road in a farm field where water lapped at the edges of the thoroughfare and reached toward the horizon, said they have had enough and will advocate for additional change. They plan to make a lot of noise in Congress about their continued challenges because they feel they have no choice. "We need Congress to change the law and we need to reel in the Corps of Engineers," Lueth said, referring to legislation surrounding the Missouri River waters. "It's a simple thing, but it still requires a vote. Urban people have a voice with the Green New Deal and things, but we're losing our rural rights." Farmers aren't the only ones who were openly hostile toward the Army Corps of Engineers amid this week's flooding. 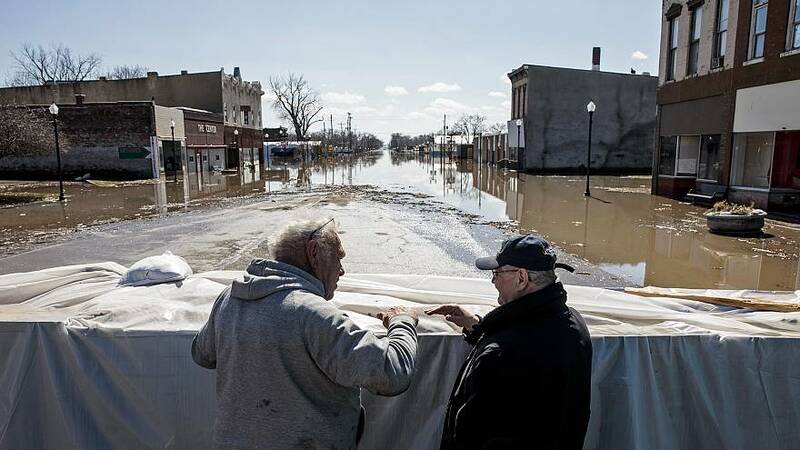 Floodwaters overtook more than three-quarters of the town of Hamburg, Iowa, a small hamlet of 1,400 that dates back 150 years. The town had flooded in the past, but never past Hamburg's middle intersection, where a flagpole stands. "Parts of my house are 140 years old, parts are 120, and it's never had water in it. 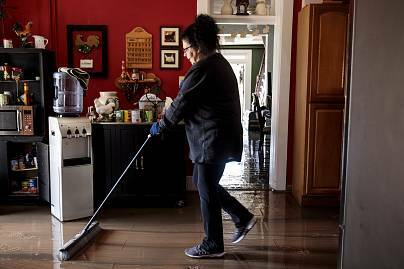 This is shocking for us," said Roxanne Sebek, 58, as she swept water and mud across her floor and out the doorway. Multiple Hamburg residents openly questioned whether the town could survive this flood and said that they'd lost hope after they were unable to save an addition on their levee six years ago that kept floodwaters at bay in 2011. That part of the levee was dismantled by order of the Corps because it did not meet federal regulations and the town could not afford the $5.5 million price tag to get it there. "I think people will leave. I honestly do," said Charlie Winkler, 68, who has lived in the town for 64 years and compared the flood to 2011. "We lost a lot last time and major businesses got hit this time around." Of the town's 32 businesses, only two were untouched by the floodwater. The John Deere dealership, which provided approximately 30 well-paying jobs, had water above its roof. Mayor Cathy Crain, 67, spoke of these employers as the town's lifeblood — losing them could be an existential threat to the future of Hamburg. She said she was working to make sure that all of the major employers had whatever they needed from her office, and had already started pitching a "Hamburg 2.0" idea even as floodwaters had not yet quite receded from a makeshift levee that ran through the center of town. No matter the price, she said, the town would need to build a permanent levee, as high as the emergency one they had built — and the government would foot at least a portion of the bill. "Sure, we'll deal with our share of water," she said, sitting in the home economics room of the local school that had turned into a station for emergency supplies. "We're not expecting to be exempt. We don't expect that, but you know what? Enough. We're going to get enough money, and we're going to grow our town." But for many residents and business owners in the rural town of Hamburg, the future is still unclear, despite the mayor's optimism. For 13 years, Tina and Bhaskar Patel have run the Hamburg Inn, a small red-brick motel not far from the center of town. The waters rose to the roof of their business, where they also lived. Tina, 53, sobbed in the parking lot of the Hamburg's elementary school as the couple considered their future. "We'll come back and see what's left. Maybe we can reopen the business," said Bhaskar Patel, 57, as they walked to their car just before driving to Des Moines to stay with their daughter. "But if we have to replace the building, we may have to move somewhere else." 'Love these work trips,' he posted. Now he's unaccounted for in Sri Lanka.